ATLAS has been collecting increasing amounts of data at a centre-of-mass energy of 13 TeV to unravel some of the big mysteries in physics today. 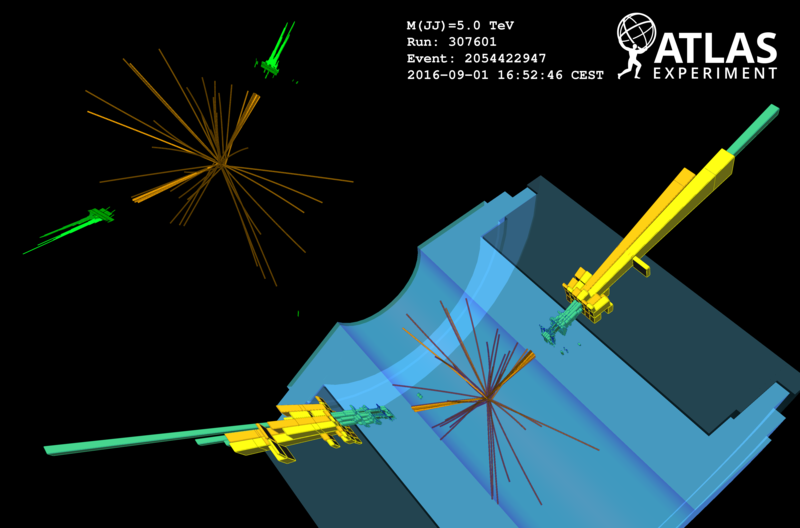 For instance, why is the mass of the Higgs boson so much lighter than one would expect? Why is gravity so weak? Many theoretical models predict that new physics, which could provide answers to these questions, could manifest itself as yet-undiscovered massive particles. These include massive new particles that would decay to much lighter high-momentum electroweak bosons (W and Z). These in turn decay, and the most common signature would be pairs of highly collimated bundles of particles, known as jets. So far, no evidence of such new particles has been uncovered. The ability to distinguish jets initiated by decays of W or Z bosons from those initiated by other processes is critical for the success of these searches. While the energy flow from the bosons exhibits a distinct two-prong structure from the two-body decay of the boson, no such feature exists for jets from a single quark or gluon – the latter being the most frequent scattering products when colliding protons. In the past, ATLAS identified this two-prong structure using its fine-grained calorimeter, which measures the energy of the particles inside jets with good resolution. However, in very energetic jets from decays of particles with masses of multiple TeV, the average separation of these prongs is comparable to the segmentation of the ATLAS calorimeter. This creates confusion within the algorithms responsible for identifying the bosons, limiting our sensitivity to new physics at high masses. In contrast to the calorimeter, the ATLAS inner tracking detector reconstructs charged particles with excellent angular resolution, but it lacks sufficient momentum resolution. A new ATLAS analysis combines the angular information of charged particles reconstructed by the inner detector with the energy information from the calorimeter. This lets ATLAS physicists eliminate the limitations in identifying very energetic jets from bosons. Similar to increasing the magnification of a microscope, this improvement to the ATLAS event reconstruction software allows it to better resolve the energy flow in very energetic jets. This improved magnification allows physicists to also optimize the analyses techniques. Making such improvements while collecting more data is necessary to maximize the potential for discovery when exploring new kinematic regimes. This time no new physics was seen, but the technique can be applied to many more searches – and still larger datasets. Search for diboson resonances in hadronic final states in 79.8 fb−1 of proton-proton collisions at 13 TeV with the ATLAS detector (ATLAS-CONF-2018-016). LHCP18 presentation by Jeremy Robert Love: Searches for heavy resonances with ATLAS. Improving jet substructure performance in ATLAS using Track-CaloClusters (ATL-PHYS-PUB-2017-015). Search for diboson resonances with boson-tagged jets in proton-proton collisions at 13 TeV with the ATLAS detector (Phys. Lett. B 777 (2017) 91, arXiv: 1708.04445, see figures).